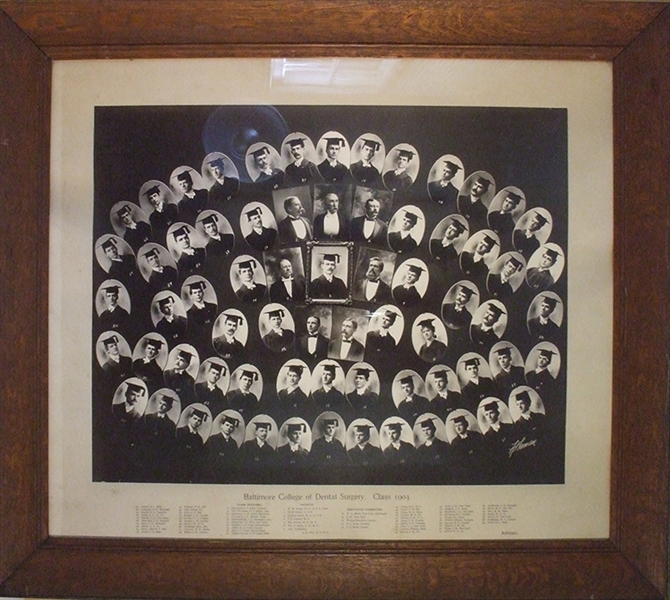 composite of 61 students and faculty, each ID’d on the mount. The image is framed, 30” x 24” sight, in oak frame.The image is ID’d in the negative as Ashman. William Ashman (1861-1902) opened his own studio in 1877, at 17 W. Lexington Street . The Baltimore College of Dental Surgery was founded in 1840 and was the birthplace of the Doctor of Dental Surgery (D.D.S.) degree. It is known as the first dental college in the world. (formerly the Rex Stark collection).